Pumpkin Crunch Cake is brimming with fall flavors. 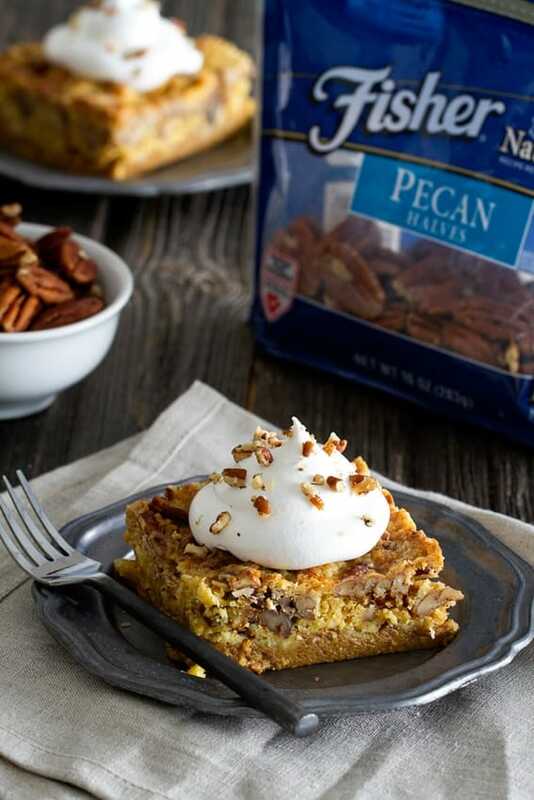 Top each slice with a dollop of whipped cream and chopped pecans to create the perfect pumpkin dessert. If you happen to follow me on Instagram, you are probably aware that I just returned home from a culinary conference in Jamaica. While I loved spending time with some of my favorite people on Earth and making new friends, it was hot. Like glistening in the sun, potentially soaking through your clothes, the minute you walk out the door hot. So when I hopped off the plane and was greeted with 52 degrees of crisp fall weather, I was pretty excited for a few reasons. Namely boots, pumpkin and not having to shower three times a day. It’s the little things. 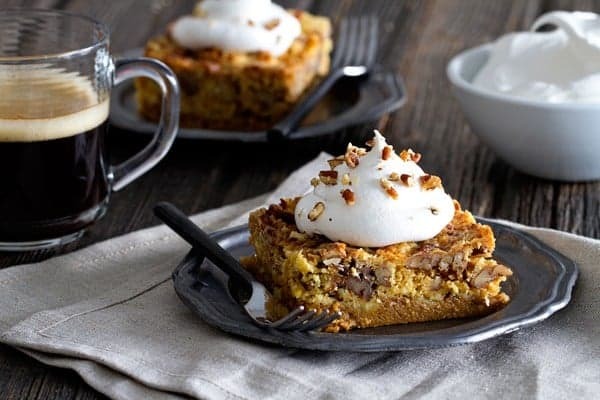 Growing up, Pumpkin Crunch Cake was a dessert staple at my Nana’s house. Not only is it super simple to make, it’s also incredibly delicious. With just a handful of ingredients and minimal effort, you can create a rich, flavorful pumpkin dessert that’s perfect for Thanksgiving, or just a random Thursday night. Sometimes Nana would leave out the pecans, but not me. There’s just something about them, especially when combined with pumpkin and warm spices, that I can’t skip. You might think I’m crazy, but I actually love this cake year-round. Thanks to canned pumpkin, it’s something you really can whip up whenever the mood strikes, be it April or October. There’s no shame in reveling in pumpkin and pecans when the temperature is above 55°F. Nana always made Pumpkin Crunch Cake with a mix, and I have to tell you, cake mixes have come a long way since I was a little kid baking in Nana’s kitchen, and I love the fact that I find mixes without all the artificial stuff. 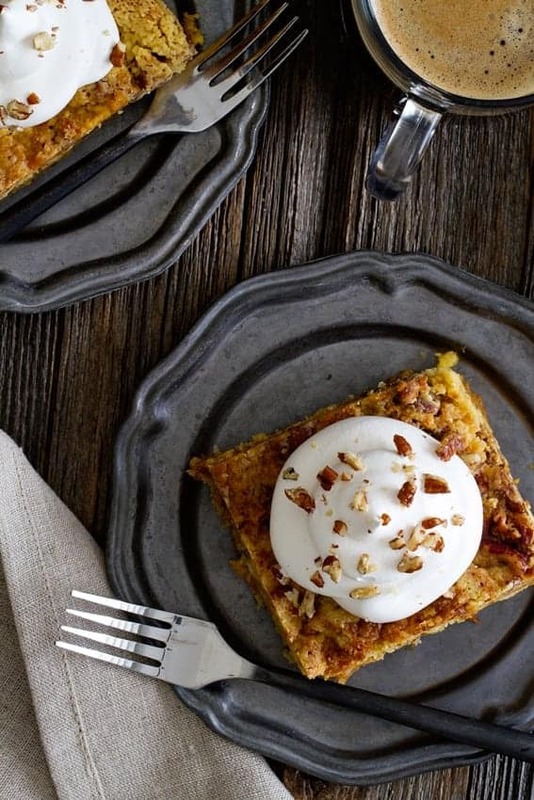 Using a yellow cake mix also makes Pumpkin Crunch Cake incredibly easy to whip up. Seriously, it will probably take longer for your oven to preheat than it will for you to get the cake ready to bake. Since so many of the ingredients are pantry staples, it’s easy to pull together at the last minute, completely stress-free. I especially love using Fisher Nuts in this recipe because they’re preservative-free. Nothing in the bag but the nuts as they came off the tree. That’s something this dessert lover can get behind. The way Pumpkin Crunch Cake comes together puts it in the “dump cake” category. I know, the phrase “dump cake” is kind of weird, but trust me on this one, ok? A dump cake just means that you “dump” the ingredients in the pan and everything magically comes together in the oven. 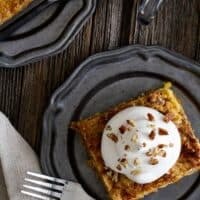 Since you whisk together the evaporated milk, pumpkin puree, eggs, sugar and spices first, Pumpkin Crunch Cake does require one more bowl than most dump cake recipes. But I promise it is still super simple. Once that mixture is spread in the pan, you sprinkle on the cake mix and pecans and then drizzle melted butter all over the top before baking. The result is a cake that is moist on the bottom and has a buttery, crumb-like texture on top. It’s heavenly. Can’t get enough pumpkin? Neither can I. Luckily, I’ve got you covered. Be sure to check out my Pumpkin Roll, Pumpkin Cheesecakes with Salted Caramel Sauce and Pumpkin Pecan Bars – they’re all seasonal staples around here! Oh and don’t forget the Pumpkin Pie Spice! You can even have pumpkin for breakfast. Try my Pumpkin Bread, Pumpkin Cream Cheese Muffins, or Pumpkin Pancakes. Now if you’ll excuse me, I need to run out and buy a few more cans of pumpkin puree. Preheat oven to 350°F. Butter a 9x13 inch baking pan. In a large bowl, whisk together the pumpkin puree, evaporated milk, eggs, sugars, vanilla, pumpkin pie spice and salt and well combined and smooth. Pour mixture into prepared pan and spread into an even layer. Sprinkle dry cake mix evenly over the pumpkin mixture and use you hands to gently press it into the batter. Sprinkle the top of the cake with chopped pecans and evenly drizzle the melted butter over the entire cake. Bake in preheated oven for 40 minutes. At this point, check your cake. If the top is becoming to brown, cover the cake with a piece of foil for the remaining baking time. Continue baking an additional 10-20 minutes or until set. Remove pan to a wire rack to cool completely. Chill for a few hours before serving. If desired, top with whipped cream and chopped pecans before serving. I made this cake with chocolate chips, and without the pecans. It was simple and delicious! Next time I’m going to try it with devils food cake mix. So happy to hear you loved it, Tanya! Thanks so much for leaving your feedback! Made this tonight, SO GOOD!!! Yay! So happy you liked it! Thanks so much for stopping by and leaving your feedback! If you look in the recipe card, there is a little thumbnail image. Under that image, it says “print recipe” if you click that, you should be good to go! I used a spice cake instead of yellow. Yummy! I have done this before too! Sooo good! I made this for the guys in the field during our recent corn and bean harvests. They LOVED it! Very filling and rich dessert! Easier than pie! Can you use condensed milk rather than evaporated milk? I would not recommend this substitution. Thanks so much for stopping by! Happy Baking! I commented last year, but feel the need to comment again. I just made this for the 142879658th time, and it’s as amazing as ever. And I’m unashamed of how many times I’ve made it. LOL! Yay, Wade! So glad to hear you enjoyed the cake – again! Thanks so much for stopping by! Happy Baking! Hello! This cake has a great flavor, but mine did not set well. Do you have to put it in the refrigerator to get the pumpkin part to set. I felt like maybe the cake didn’t get all the way down into the pumpkin part. Hello! Yes, the recipe states that the cake needs to chill for a few hours before serving. I hope this helps. Should the bottom be extremely moist? Hello, Darlene. Yes, the bottom is pretty moist, almost pumpkin pie like. You’ll definitely want to chill it according to the directions so it firms up before serving. I promise – it’s delicious! I made this for Thanksgiving…. while everyone else ate leftover turkey the next day, I gobbled this up for breakfast, lunch, dinner and snack!!! (No shame!!!) I have one in the oven right now for work tomorrow….. love it!! Girl, SAME. I could eat this for every meal and to be honest, I always like it better a couple of days later. Happy baking AND eating! Do you have to use pecans? Can you use raisins instead? Sure! You can leave out the pecans for sure! I think adding in raisins would be just fine too! Your Pumpkin Crunch Cake looks so awesome. I plan on baking it tomorrow, I have all the ingredients on hand. Looking forward to more wonderful recipes. Thanks so much for stopping by, Sharon! I appreciate you taking the time to comment. Happy Baking! Should I leave out the added salt in F. Do not have unsalted butter? Hi Jen – You may still need a pinch of salt, but likely not as much as the recipe calls for. Happy baking! Does this have a nutrition chart. Thanks for stopping by! This recipe does not have a nutrition chart. Can u substitute gluten free yellow cake for regular? I have to go gluten free and would love to try this. Any idea what the calorie and fat content is for this recipe? It looks wonderful! Thanks so much for stopping by, Marie! I’m not sure what the nutrition facts are on this recipe. Happy Baking! Hi Priscilla – Pumpkin pie filling has some additional ingredients that would require adjustments to the rest of the recipe. If you do happen to try it, I’d love to hear how it turns out. Happy baking! So happy to hear you enjoyed the cake, Sandy! Thanks so much for stopping by and leaving your feedback! Can’t wait to make this! It looks absolutely yummy! I love anything pumpkin! Thanks so much for stopping by, Debbie! I appreciate you taking the time to comment. Happy Baking! This cake looks amazing! I was wondering if you think I could use sugarfree cake mix. Hello! I haven’t attempted this recipe with a sugar-free cake mix, so I am not sure of the result. If you happen to give it a try, I’d love to know how it turns out. Thanks so much for stopping by. I did it’s just as good! That’s great to know. Thanks for sharing, Elizabeth! Made this to ring in pumpkin season. It was a big hit. Such a easy delicious smelling recipe. So happy to hear you enjoyed the cake, Jennifer! Thanks so much for stopping by and leaving your feedback! I got this recipe many years ago when I live in Hawaii: am asked to make it all through the fall. Thanks so much for stopping by, Marcia! I appreciate you taking the time to comment. Happy Baking! Thanks so much for stopping by, Carmen! I appreciate you taking the time to comment. Happy Baking! Here’s a link to the brand I use so you can see the packaging. Happy Baking! Me too, Shirley! Happy Baking! I hope you enjoy it as much as we do, Pat! Oh my GOD! This is so good! I made it and brought it to work and people gobbled it up and wanted the recipe. Thank you! So happy to hear you and your coworkers enjoyed the cake, Deborah! Thanks so much for stopping by and leaving your feedback! Do you leave the cake covered while cooling? Also once cooled by “chill” do you mean refridgerate before seving?? Ive taken it out of the oven and had it covered while cooling and i noticed moisture at the top of the foil so i uncovered as it is still in the process of cooling. So i need to know if i put in in the refrigerator next and if im suppksed to leave it uncovered. Hoping to hear back soon. Thanks! Hi Jamie – Leave the cake uncovered while cooling. Once cool, place it in the fridge to chill for several hours so it sets up properly. Happy baking! Hello! I haven’t attempted making this cake gluten or dairy free, so I am not sure of the right method or result. If you happen to give it a try, I’d love to know how it turns out. Thanks so much for stopping by. Hi there- Yes, it is best to keep it refrigerated. Happy baking! I made this for friends and family.. and now at thanksgiving I will never make pumpkin pies again this is far superior and EASIER.. great dished up and zapped for few seconds in microwave with whipped cream! Great for a crowd!! So happy to hear you enjoyed the cake, Rita! Thanks so much for stopping by and leaving your feedback! Has anyone tried making this GF? What did you use? How did it turn out? Hello! I haven’t attempted making this gluten-free, so I am not sure of the correct substitutions. If you happen to give it a try, I’d love to know how it turns out. Thanks so much for stopping by. What is pumpkin spice? Its not stocked in my town? Can i create my own using cinnamon nutmeg and cloves? I too have been making this recipe for years and make it exactly as you do. Right down to the Fisher pecans! Planning on making it tomorrow. Just checking all my ingredients when I saw some of the comments. Several years ago I discovered once I had my pumpkin crunch together if I put it in refrigerator several hrs. BEFORE I bake it no problems with the runny pumpkin firms up beautifully. Also like to seve it while its still warm with a small scoop of pumpkin ice cream! Sinfully good. Can’t wait. So happy to hear you enjoy the cake, Jane! Thanks so much for stopping by and leaving your feedback! Do you put a whole box of yellow cake mix on top of the pumpkin mixture? Hello! Yes, that is correct. Thanks for stopping by. Happy baking! I love this dessert..my mother was pre diabetic, I substituted regular sugar with Stevia/ or Splenda and used a sugar free cake mix…you can’t tell the difference.. So happy to hear you enjoyed the cake, Margot! Thanks so much for stopping by and leaving your feedback! Can you use regular butter instead of unsalted? Hi Linda – You certainly can, although you’d need to use less salt to compensate for the salt that’s already in the butter. Hope this helps! Happy baking.